There were some really fantastic scenes where I felt that drop in my stomach, I gripped the book a little tighter, and I chewed my lip in anxious anticipation. I was absolutely taken with the idea of an avanc. 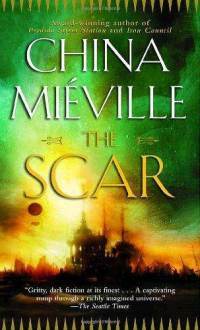 Mieville gives you just enough a taste of the creature to be totally fascinated. The two scenes that really got to me were when they raised the avanc and when they went down to it + what happened after. Just noticed I've been writing this post backwards from how I normally would...here are some general thoughts on the book. The beginning was primarily slow build, the story doesn't really get going until about 200 pages in. This early segment contains a lot of setting up characters and setting for the story that's about to come, you really get this sense of 'Okay, that's who this person is...how they are going to mess with things later on?'. There are a good number of characters, probably slightly more than I'm used to (says the Tolkien fan.....). I wasn't paying as much attention as I should have when they were all being introduced so I had a little trouble later on keeping track but Mieville individualizes them well. that being said, I feel that the strongest character (as was the case with Perdido) is the city. I don't want to say too much about Armada, because that's the best part of reading the book (in my humble opinion). Suffice to say Mieville knows how to craft a setting.